Does social media make promotional benefits of the newspaper press release a thing of the past? Of course not. Especially in small town chronicles where local items make up a majority of the news. Adunate’s recent copywriting project was this release for Forward Mutual Insurance Company—a strong, innovative company befitting of its name. 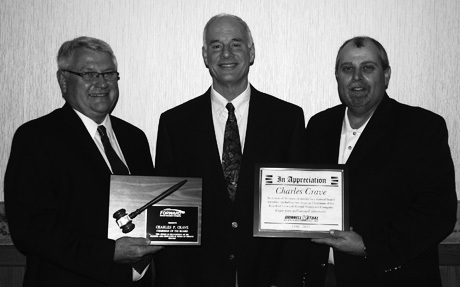 Forward Mutual Insurance Company and Grinnell Mutual Reinsurance Company recently presented Charles Crave with appreciation for his leadership and contribution to the mutual insurance industry. From left, Howard Wiedenhoeft, president and CEO, Forward Mutual Insurance Company; Charles Crave, retiring chairman and director, Forward Mutual Insurance Company; and Curt Capper, regional marketing manager, Grinnell Mutual Reinsurance Company. IXONIA, WI, (March 24, 2012) – Chairman Charles Crave announced his decision to retire as a board member of Forward Mutual Insurance Company at its recent annual policyholders’ meeting. Crave, who has headed the Ixonia company since 2010, wishes to devote more time to his farm and family. Crave has been involved in the insurance industry since 1996, when he began serving as a director for Watertown Mutual. He was elected to serve as the company’s president the following year. In 2006, he was instrumental in the merger of Watertown Mutual Insurance Company and Concord Mutual Fire Insurance Company. In 2009, Crave once again guided Watertown Mutual through merger agreements, this time with Ixonia Mutual Insurance Company. On January 1, 2010, the two companies joined together and formally adopted the new name of Forward Mutual Insurance Company. Crave was elected chairman of the board. Crave, together with his three brothers, owns Crave Brothers Farm and produces Crave Brothers Farmstead Classics specialty cheeses. Also at the annual meeting, policyholders re-elected Mark Mallow, Robert Salov and Dale Zastrow to serve as board members. Other members of the board are David Blank, Donald Bohn, Roger Degner, David Flood, Donald Reese, Randall Wegner, Dale Wolf and Stephen Zillmer. Stephen Zillmer was elected to serve as chairman of the board and Roger Degner was elected to serve as vice-chairman. In the fall of 2011, the mutual began construction on a 1500 square foot addition to its office building, located at W1202 Glenview Ave., in Ixonia. The project will be completed in spring and an open house is scheduled for Friday, May 18, from 2 to 6 p.m. All policyholders and the public are invited. Forward Mutual Insurance Company provides insurance to home and farm owners in 16 counties throughout southeast Wisconsin. It maintains a policyholders’ surplus of $5.1 million and an A.M. Best rating of A minus. 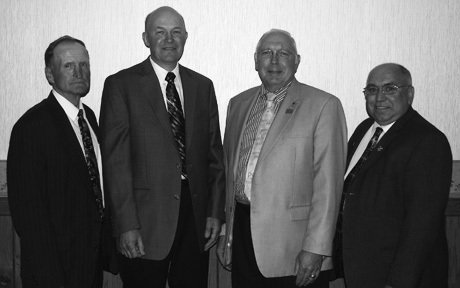 Serving as officers for Forward Mutual Insurance Company are, from left, Donald Bohn, treasurer; Roger Degner, vice-chairman; Stephen Zillmer, chairman; and Donald Reese, secretary.